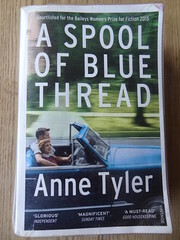 I’ve loved Anne Tyler’s novels in the past but I’ve put this one to one side half finished. Not even the 5 hour train journey back from Pembs provided sufficient incentive to continue reading about the Whitshank family. I wasn’t interested in any of the characters, nor their suburban Baltimore world.